One-on-one meetings take a lot of time, and the investment increases as you grow. Here’s why it’s worth it. When I ask entrepreneurs about the things they’d do differently if they were starting over, I rarely get answers about sophisticated strategies. Nobody has told me that they wished they had started out with highly segmented marketing funnels, or high-end automation software, or anything like that. Those are the kinds of things that you have to grow into. They’re hugely valuable for businesses of a certain size and maturity, but not so much for an early-stage startup. Instead, it’s almost always the simple stuff that they regret missing. Things like listening more to their customers, or establishing core values. But there’s something else that I’ve been thinking about that I wish I had been doing from day one. Something insanely simple; you don’t need any tools or money to do this. But something so powerful that it has completely changed our team. We’re a remote team (though this is something that all teams should be doing), and we don’t spend all day with each other. We only recently started having a daily meeting where we hear everyone’s voice every day. It’s easy for things to go unnoticed. If an employee is having a bad day or week, or is unhappy in their role, or if just about anything else is wrong in their eyes, it’s easy to hide it. Cultures where important things get left unsaid are unproductive, unpleasant and frankly toxic to the business. And without any encouragement or processes for pulling those important things out of people, we were in danger of building that kind of culture. It was causing our progress to slow down, work just wasn’t that fun for some of the people on the team, and it even led us to making a couple of bad hires when we didn’t make an effort to talk openly about whether the candidates were good fits for Groove. About six months ago, on the advice of a friend (who I was having the “what do you wish you had done differently?” conversation with), I began scheduling one-on-one meetings with every employee. This is, perhaps, the most important shift. Over six months, we’ve gone from a culture of silos, with everyone working and living in their own space, pretty much disconnected from the rest of the team aside from Slack and our weekly (now daily) calls. I noticed an interesting trend once we started these one-on-ones and I asked people to be more open about how they were feeling, and extended an invitation to be honest, even with negativity: that openness began to extend to Slack, and to the rest of our team communication. Slack became more than just a collaboration tool and an occasional water cooler; we began to have honest, substantive team discussions where people felt safe enough and empowered enough to voice their opinions. To me, that’s an indication of a healthy open culture, and that makes me very proud. One of the CEO’s most important roles is to set the overall vision for the company. And ultimately, it’s a responsibility that lies solely on their shoulders. Many will say that your strategy should be pulled from your customers’ needs, and that’s true. 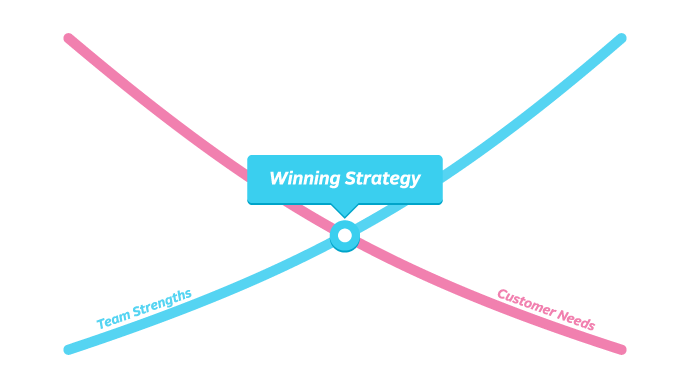 But it’s not complete: I believe good strategy is finding the intersection between your customers’ needs and your team’s strengths and passion. The one-on-one’s have helped me uncover many of those strengths and interests that I wasn’t acutely aware of before, and from a strategic perspective, this has helped us map better plans for what every member of the team should be working on. It’s so, so important [for a CEO] to be a good communicator, and to not just communicate what you’re doing to the team, but why you’re doing it. I’m naturally skeptical about a lot of things, so I always approach things with why is it like that, or why make that decision, because ultimately I want to find the best marketing message or the best product decision, and if someone comes in and says we’re doing this, but I don’t know the background or thought process behind the why of that decision, I remain skeptical. People do need to understand why we’re doing what we’re doing, and once they understand the why and the trade-offs, then people are more bought in. They understand that we’re doing something because there’s a good reason to do it and not just because Ryan says so. One-on-one’s are a great time to answer the “why” questions that employees sometimes have. Everyone’s interests and goals are a bit different, so being able to tailor the “why” to each employee is valuable in helping to get people excited about the work that we’re doing. Especially in startups where everyone is heavily relying on everyone else to do their jobs (or the company fails), trust is hugely important. Having consistent, effective communication between the team helps to foster that trust. It builds more trust on my end, as I learn more about my employees and trust them to do more and more things. And critically, it builds trust on the team’s end, that I care deeply about supporting them and making Groove a great place to work, and that I’m committed to learning and doing everything I need to do to make that happen. This one is obvious, but ridiculously important. On more than a handful of occasions, we’ve been able to nip issues in the bud in our one-on-ones that could’ve (and in the past, would have) easily become much larger problems for us. When an employee says that something is really bothering them, they’ve probably been thinking about it for a while. But when negative feedback comes off-hand that something new that we’re doing or some new trend isn’t exciting to them, there’s a good chance that if the issue isn’t addressed, it’ll eventually turn into something that’s really bothering them. And that’s something that the one-on-ones help me pick up. These unaddressed issues, over time, make people unhappy, unfulfilled, and eager to leave. Nipping them in the bud keeps employees happier. When I ask our team in our one-on-ones what I could be doing better to help them, I’m not paying lip service; I genuinely want to know and get better. And to be honest, it took a while before people began to answer this question honestly. At first, I got a lot of “nothing, everything is great.” But I kept at it and did my best to ensure that everyone knew I was genuine in my intentions, and eventually I began to get great, constructive feedback. That feedback has helped me become a better communicator, manager, recruiter, arbitrator, coach, decision-maker and more. It has also influenced a lot of changes in the company, like our meeting rhythm and hiring of a business coach. When anyone on the team improves, the entire team gets better, and the CEO is certainly no exception. Getting candid feedback from the team is something that most CEO’s tragically miss out on. Don’t be one of them. Establishing a rhythm is crucial; sporadic, every-now-and-then meetings send a signal that these aren’t that important to you. And if you send that signal, your employees won’t take them seriously, either (why should they?). This feedback will help you become a better CEO, which will make your entire team happier, and your business healthier. Some people on your team, especially at first, probably won’t want to open up all that much. That’s okay. This might the first time you’ve ever asked them to do that. It’s not something that’s commonly done in businesses, so it takes getting used to, and the fear of saying the wrong thing takes time to get over. Be patient, be persistent, stick to your regular call schedule, and generously reward anything that the employee does—thank them deliberately and genuinely—that suggests that they might be opening up a bit. These meetings aren’t just to talk about work-related things and how the employee is feeling about the company. As you build better relationships with your employees, you’ll also begin to learn more about their personal lives (and share yours with them), which—for those employees who want that—can help you build much better, deeper relationships. Don’t assume that you have to keep these about business. When I started doing these, I asked people that I knew and spent hours doing research on good questions to ask during one-on-one’s. As it turned out, Jason Evanish (whose business, Lighthouse, helps managers run better one-one-one’s) had put together an amazing list of 101 questions here, in addition to the “how can I do better?” question I mentioned above (separated from the pack because it’s that important). To make things easier for me (and to make it easier to take notes and track any feedback that I needed to), I put Jason’s questions into a Google Spreadsheet. Here’s a link; just hit File → Make A Copy to create your own version that you can make notes in. All credit goes to Jason for the questions. Hopefully you find the spreadsheet format as useful as I do. If you’re not already doing regular one-on-one meetings with every employee on your team, I hope that this post inspires you to start. And if you are doing them, I hope that you’ve picked up a tip or two that will help you get more out of these valuable sessions. Either way, if your experience is anything like ours, one-on-ones will (or have) become one of the most important things you can do to improve your team’s culture and happiness.